Claypot Chicken Rice is another popular version of chicken rice in Malaysia, and throughout the South-East Asia. The rice is cooked in a clay or sand pot and top with some Chinese sausages, and salted fish. If you don't have the apparatus, then cook the rice in a regular pot or with a rice cooker. Chicken: Cut the chicken into smaller pieces. Combine the marinade ingredients and allow the chicken to marinate in it for 3 to 4 hours in the refrigerator. Divide into two portions. Sauce: Combine the sauce ingredients, simmer until the sugar has melted. Then set aside. 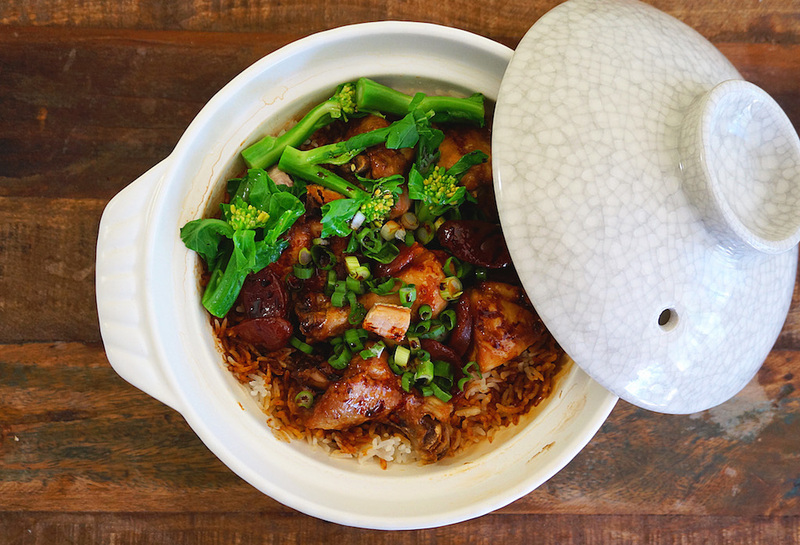 Rice: Wash the rice in several changes of water and place into a claypot with 2 cups of chicken stock. Bring it to a boil on medium heat. Then cover and simmer on low heat, for 5 to 6 minutes. Add the chicken with its marinade over the rice, cover and simmer for 10 minutes. Then add salted fish, Chinese sausage (Lap Cheong) and drizzle in about 2 to 3 Tbsp of the sauce. Cover and simmer for another 8 to 10 minutes. * You can add any vegetables of choice, once the chicken is fully cooked. To Serve: Fluff the rice and serve immediately with some chopped scallions. omigoodness this looks good. I'm bookmarking the recipe for the next time I pick up lopcheong at the Asian food market. hello.. when would you place the chicken on top of the rice? when it's still raw or when it's half cook? thanks! @a-anntot: If using rice cooker, place the raw marinated chicken together with the rice before cooking them. Scrumptious and mmmmmmmm heavenly. It's strange to find this recipe is extra delicious when you lived far away :-) Thank you for sharing the recipe and the other one-meal rice dishes.